Nudge brands are brands built on interactions, not attitudes. They are mostly defined by experiences, not TV campaigns. They are designed around people's inconsistencies and errors, not for machines. They are simple, not complex. They like to break things into small chunks that are less daunting than big tasks. They focus on changing behavior, not generating awareness and interest. The Paris metro system card is a nudge brand. It is designed against human errors. You can use the card in any direction. IKEA is a nudge brand. It uses the power of personal investment. The more involved people are in creating something, the better they feel about the end product. Hare Krishna is a nudge brand. It is built on the reciprocity rule by giving away daisies. People should repay, in kind, what another person has provided for them. 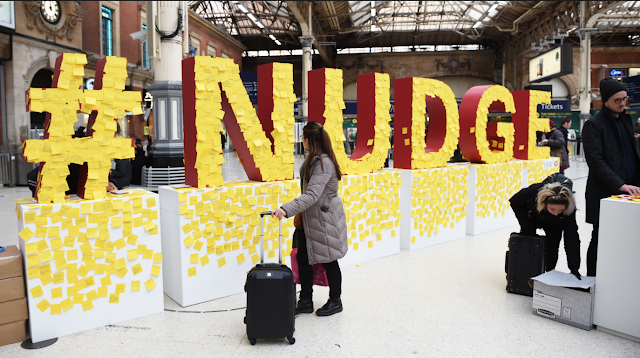 Red Nose Day is a nudge brand. It used the Benjamin Franklin Effect by asking for a favor: wearing a red nose for a day. When you ask someone for help, and they oblige, they are more willing to do you a further favor in the future than if you had been the one helping them. Amazon and Yelp are nudge brands. They use the power of social influence through reviews to drive people's decisions. People make decisions based on what those around them are doing. Today, brands are built through actions. Most of the videos we watch are through interactive devices. We are constantly making choices as we engage with brands. Each choice represents an opportunity to nudge, to piggyback on Richard Thaler's book. However, we are still taking the longer road, trying to create brand awareness, with the desire to generate interest and the hope to drive action. In an interactive world, we need nudge brands, built for the irrationalities of the human mind.